It's been one of the longest coldest winters I can remember. We didn't have any blizzards, but just steady snow day after day, with bone-chilling temperatures in the vicinity of -17 for weeks at a time. This is really unheard of. Usually you get a few days like that per year, but not long stretches of misery. So last week when it finally appeared that spring might be making a few cracks in winter's icy grip, I decided I wasn't gonna wear my winter coat anymore, just my Bears hoodie. I had to do my part to let winter know we weren't gonna sit there and take it anymore. Consequently I've been pretty cold lately. Today it was in the upper thirties, and sunny, so I thought I'd head up to Big Hill Park in Beloit to look for Skunk Cabbage. 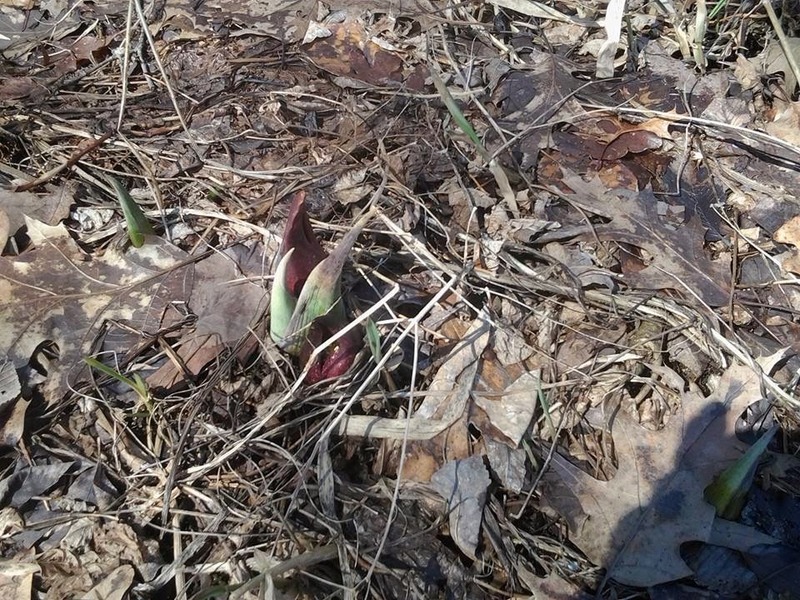 As you may know, Skunk Cabbage is the harbinger of spring. It's the first plant to come up each year, and generates so much heat as it grows that it actually melts the snow around it. It's a weird, fascinating plant. 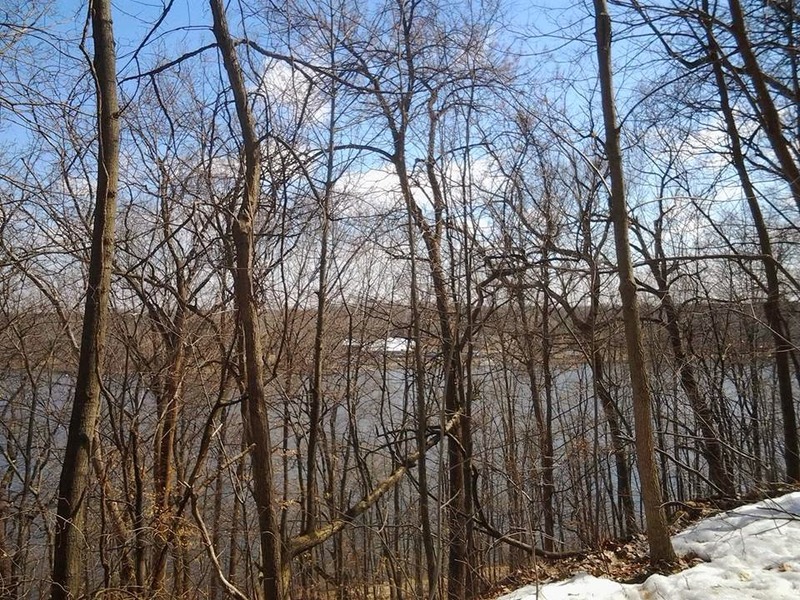 It grows in low-lying wet areas, and at Big Hill Park there's a little swampy spur of land that juts out into the Rock River, and it's a perfect spot to find Skunk Cabbage. 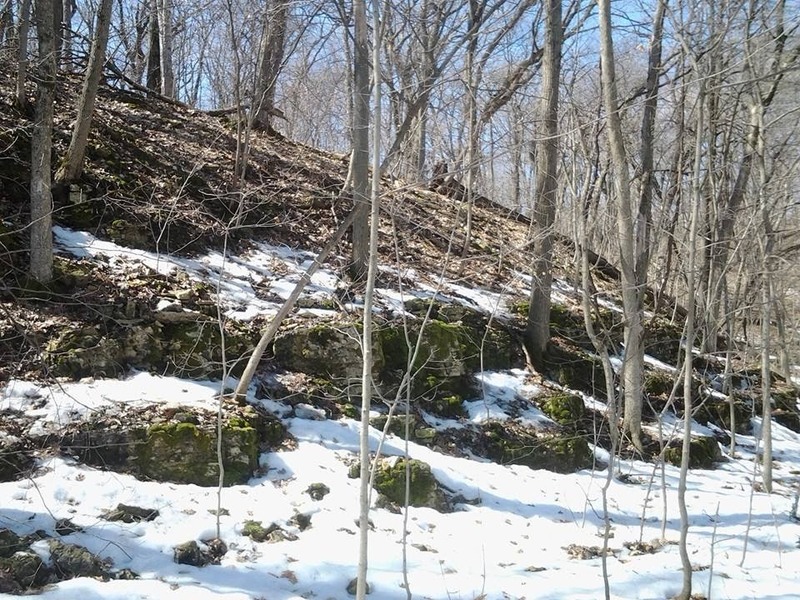 The road down to the river was stilled closed for the winter, so I parked at the top of the hill and worked my way down the slope to the main path, which winds its way along steep wooded hillsides with beautiful mossy rock outcroppings. 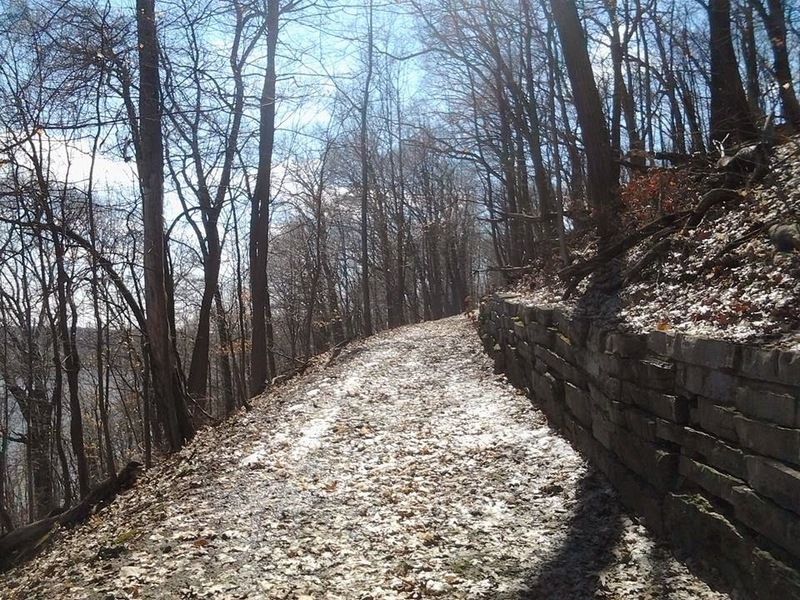 The path was clear and wet in places, and ice and slush still coated it in areas where it ran through shadow. Finally got down to the bottom, and, sure enough, the floodplain along the river was dotted with Skunkers. They were mostly still closed up, but on a few here and there the bright yellow spadix was visible through the leaves. So that means Spring is here, or at least around the corner. 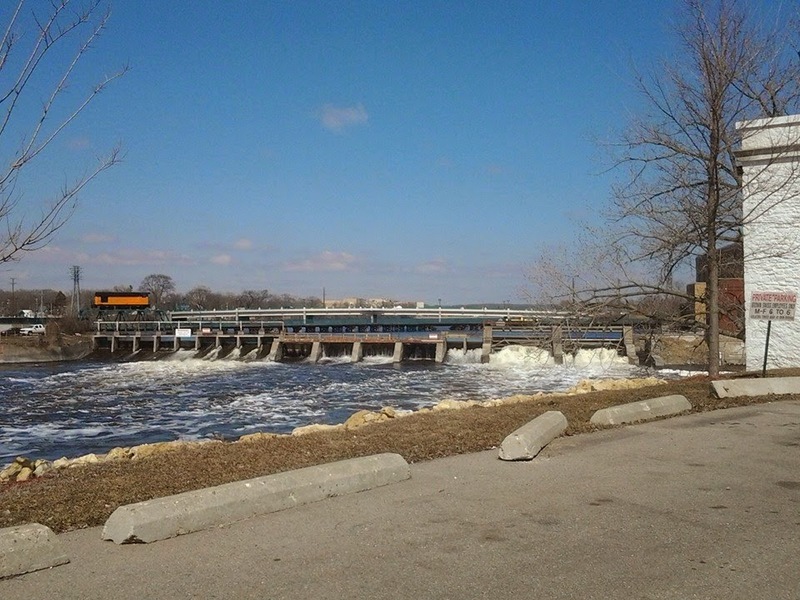 On the way home from the park I stopped at the dam to look for Bald Eagles, but I didn't see any. Now that the river is mostly unfrozen I guess they don't need to hang out at the dam much anymore (they stick around in the winter because the rushing water prevents freezing, and thus maintains their access to fish). Then back home where I filled the feeders and chased the dogs around the yard. 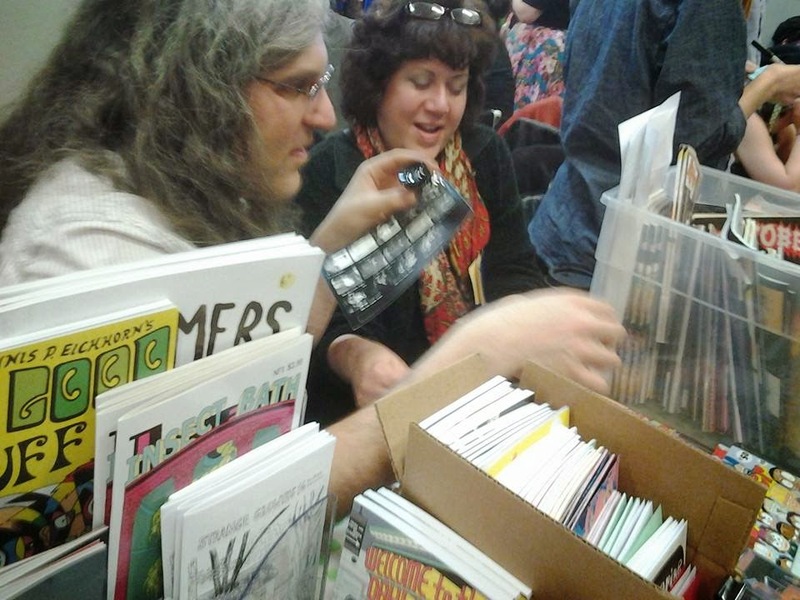 Well, it's that time of year again -- time for cartoonists and zine-publishers to start hustling around the country to attend the myriad specialty festivals and fairs that have sprung up over the last decade. 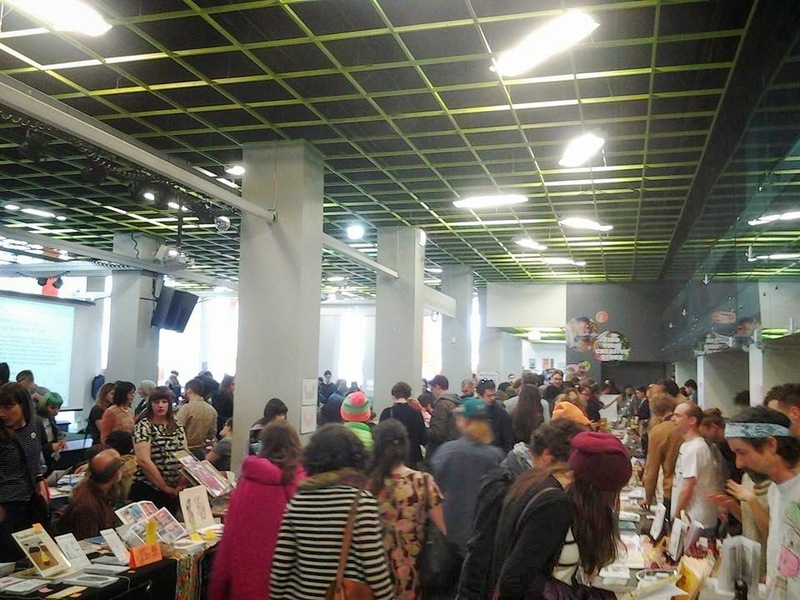 From March through November it seems like there's a zine or comix fest somewhere every weekend! 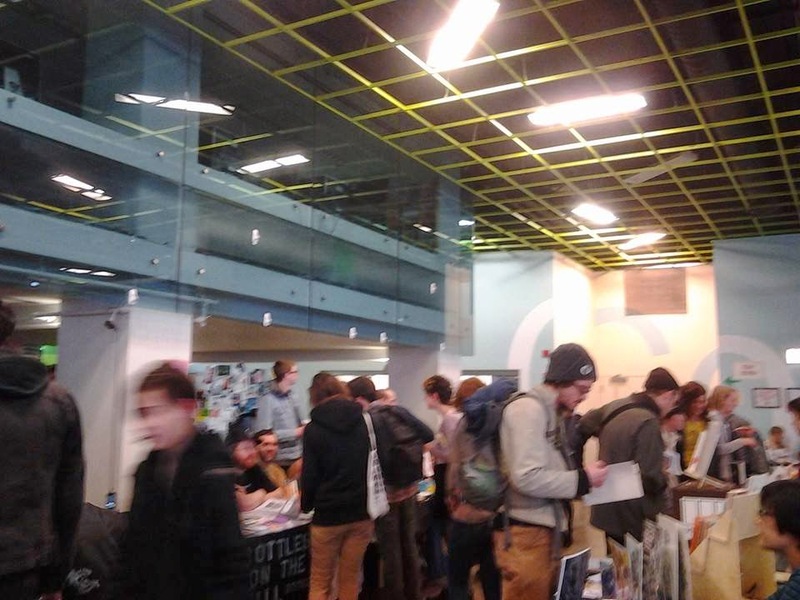 My first of 2014 was last Saturday's Chicago Zine Fest, now in it's fifth year. After a long period with no zine-based festival in Chicago (hard to believe, considering the presence of the legendary Quimby's and the huge amount of self-publishing going on in the city) it's been great to have the CZF every spring, getting bigger and better with each passing year and showing no signs of slowing down. 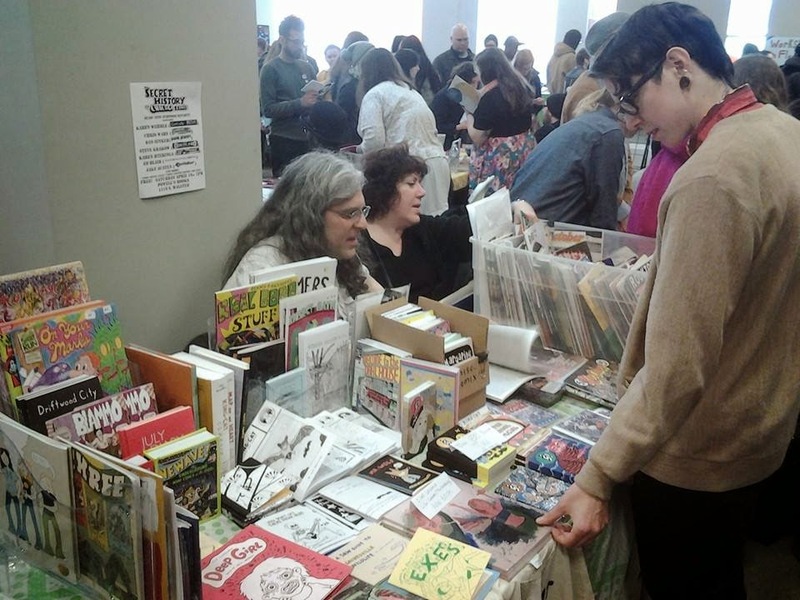 This year my table, which I shared with Chicago zine impresario Jake Austen, was located on the first floor, and after a slow start there was a steady stream of people coming through all day. I'm pretty sure this was the first year in which there were so many exhibitors everyone was limited to one half-table spot. This made for a slightly claustrophobic feel behind the tables, but I got used to it pretty quick. Sales were the best I've ever had at this show, and it was fun to see everybody. You do enough of these shows and it all becomes family-- not only your fellow exhibitors, but the people in the crowd stopping by. OG Chicago zine legend Karen Wehrle dropped by to hang out with Jake and go over their plans for the Chicago Music Zine Symposium being held next month. One minor problem was that this year's CZF was held the same day, in the same general locale, as the St. Patrick's Day Parade. It took me 2.5 hours to travel the 90 miles from Beloit to the Loop, and ten minutes to fit into the only tiny parking spot I could find once I got there. Afterwards was almost worse, having to traverse the city with lurching drunks stepping out in front of your vehicle every fifteen feet. But all in all an enjoyable day. Post-show I went up to Thai Spoon for dinner with my old pal Ray. We stopped at Quimby's to drop off their latest Spit and a Half order in person, and then I headed back out into the darkness to make my way home. Drove under the O'Hare Oasis on its last day in existence (sigh) and made it to Beloit in time to hear "Ace of Spades" come on the radio at midnight. Next up, SPACE, in Columbus April 12-13. I drove up to Green Bay yesterday (and back down) to see a retrospective exhibit of work by my old, dear friend John Rininger, who passed away in 2006. John and I met in DeKalb in the mid-80's when I would print my zine Cehsoikoe at the Kinko's on Lucinda Avenue, where he worked. We became fast friends, though I was always readily aware that John's mind was working on a scale much vaster than my own. He seemed to be able to maintain a half-dozen trains of thought simultaneously, and his randomly dispensed references and quotations nearly always flew right over my head. But in this way John's art was a mirror of his own mind. In his art, high and low, good and evil, light and dark are each bestowed their own place without discrimination, commingling in a chaotic and confusing but ultimately beautiful scene to which John bore witness. I've written about John on this blog before, but I thought I would share some photos and words about the exhibit. It was held at the Lawton Gallery at UW-Green Bay, and curated by John's longtime friend and anointed archivist Stephen Perkins. There was a nice turnout of students, plus old friends and family. John worked mostly in xerographical media (photocopies) at first, and later used digital media to print and create his work. His long-running series Catalyst Komics ran the gamut from "traditional" photocopied zines, to sculptures, ready-made objects, and one of a kind images such as the one above. Students examine a collection of collaborative artists' books from the 1980's. John's "magnum opus" was The Scroll, a 600 foot-long melange of over 1400 solvent-transferred images. In 2001 as John was losing yet another apartment, Chicago collector Marc Fischer came upon a trove of his source materials dumped in the alleyway. (Story and more images here.) Above: a sampling of some of these. John was deeply involved in the underground "artistamp" scene, and his prized possession was an old-fashioned perforating machine, which he made available for public use one day per month. Students examine several of John's artistamp pages. One wall of the gallery was given over to John's zine-form work (he, and I, called them "mags", not zines, but you get the idea). When NICE (Northern Illinois Copy Equipment) in DeKalb obtained a copier that could print in black plus blue, red, yellow, and brown toner, John found inspiration for this series of small-format collage zines. A portion of The Scroll. Curator Perkins had handcrafted rollers made to help exhibit the Scroll. 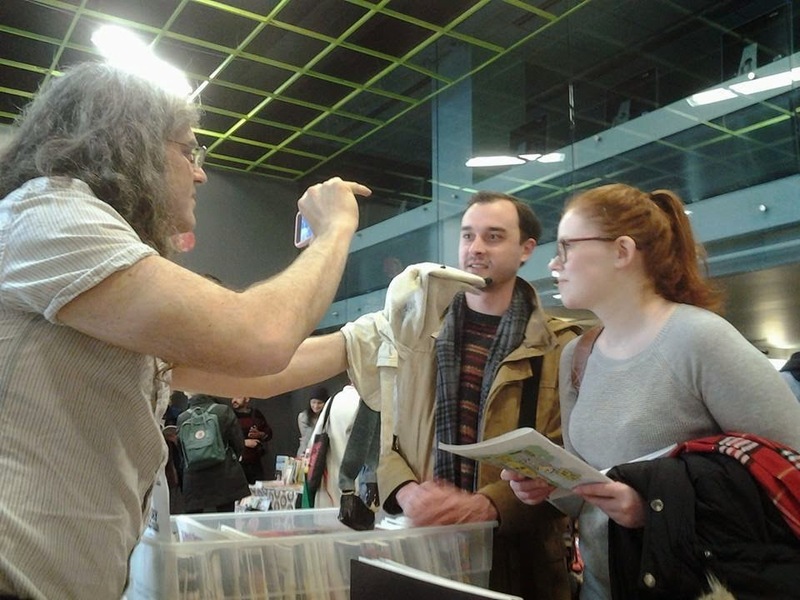 A student peruses an issue of John's collaborative zine project (with Tom Long and Gene White), Even Paranoiacs Can Have Enemies. Some sculptural issues of Catalyst Komics included an epoxied mousetrap and a (simulated) pipe bomb. Stephen Perkins talks about John's life and work. More source material from John's personal collection. 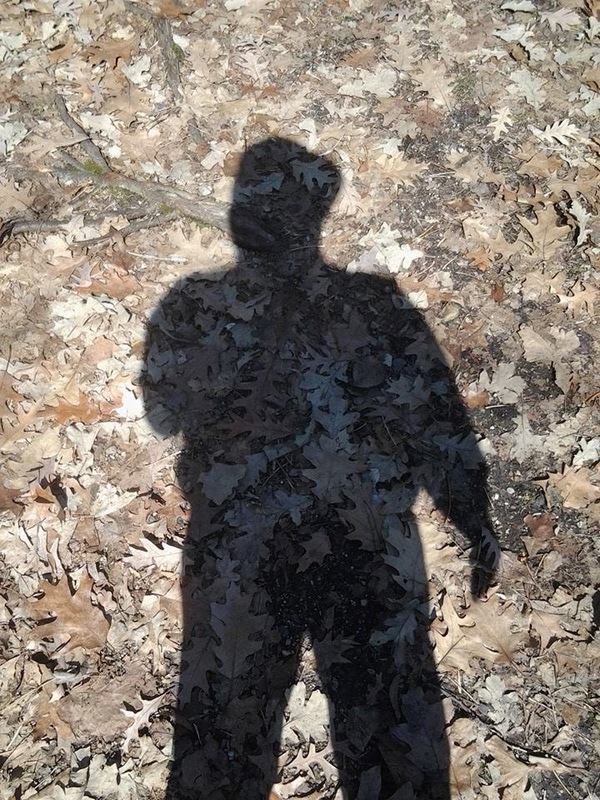 In 1994, after an off-the-cuff suicidal joke he made to a therapist, John was forcibly institutionalized for a brief period, an experience that provided much fodder for his work. Above three images: Some examples of Catalyst Komics zines. At the end of the evening the scroll was ceremoniously unfurled for the audience. In this world there are artists and there are artists. John was the kind of artist where the line between his life and his work ran blurred, where compromise was never sought or accepted. He was a remarkable guy, and seeing his work arrayed like this in one place was pretty emotional for me. I'm glad I got to know him.